In January of 1989, after a series of violent incidents sent shockwaves throughout Hip Hop, KRS-One convened an unprecedented group of artists to form Stop The Violence Movement, a social action initiative that was the first of its kind in Hip Hop. The project spawned a #1 single (“Self Destruction”), helped raise funds for the National Urban League, and set a new standard for social activism in Hip Hop. In the spirit of this movement, musical storyteller J.PERIOD joins forces with legendary engineer Young Guru, iconic DJ Jazzy Jeff, multi-platinum producers DJ Khalil and Rance Dopson, award-winning visual artist Ernesto Yerena, and an all-star cast of artists and activists including Black Thought (The Roots), Jesse Williams, Aloe Blacc, Andra Day, Dead Prez, Maimouna Youssef, Joss Stone, Posdnous (De La Soul), Pharoahe Monch, Sa-Roc and Rhymefest to present: The RISE UP Project, a groundbreaking social action campaign and collaborative, new album. The album’s lead single “See The Light” (LISTEN NOW) features Grammy-winning singer Andra Day and Hip Hop freedom fighters Dead Prez, over a haunting new track produced by J.PERIOD & DJ Khalil. The single’s b-side “SOLDIERS” (LISTEN NOW) also features rising stars Sa-Roc & Maimouna Youssef over a track that samples The Isley Brothers’ iconic “Ohio,” Neil Young’s famous folk anthem about Kent State, now re-framed as an anthem against police violence and rising racial tensions across America. Executive Produced by J.PERIOD, Young Guru, DJ Khalil & DJ Jazzy Jeff, The RISE UP Project album arrives on the heels of a social action campaign featuring events at The Kennedy Center, Brooklyn Academy of Music, Smithsonian NMAAHC, and Chicago’s Louder Than A Bomb Festival, including workshops and discussions with thousands of aspiring young writers, artists and activists. Inspired by the collaborative spirit of Jazzy Jeff’s annual Playlist Retreat (and made possible by a grant from the W.K. Kellogg Foundation), The RISE UP Project has made creativity and community its focus: bringing together diverse artists to create unique spaces for performance, discussion and engagement with young people around arts and activism. The RISE UP Project owes its existence to a staggering collective effort, and is a testament to the power of music to bridge gaps, spark conversation, and lift us up. In his book “A Change Is Gonna Come: Music, Race & The Soul of America,” Craig Werner details the moments before the “I Have A Dream” speech when Dr. King, understanding the moment, leaned into Mahalia Jackson to request a specific song. Even King knew: words weren’t enough to make people believe in the Dream. In order to truly change hearts and minds, and bring people together, The Movement needed MUSIC. 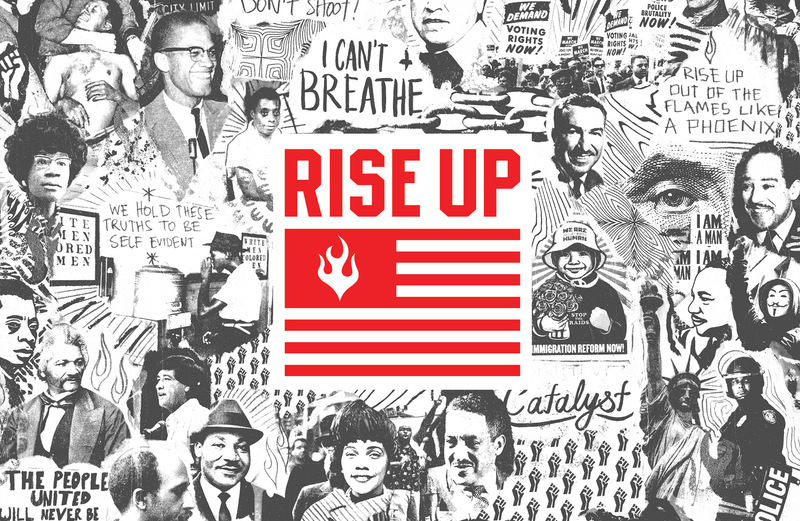 The RISE UP Project is available April 2019 on all music platforms.